There’s nothing more disappointing for a child than seeing his beloved carved pumpkin rot before Halloween. To keep your pumpkin fresh and firm, keep it away from the rain and place few packs of silica gel inside it. Just make sure to remove the packs before lighting a candle. A little humidity can leave your closet smelling moldy and unpleasant, especially if your clothes or linens aren’t completely dry. Before putting away your linens, always make sure that everything is perfectly dry. You can also add a few packs of silica gel in an open box to keep moisture at bay. Ever noticed the musty smell that old books sometimes have? Water can leave your important papers crinkly, unreadable and most of all, smelly. To avoid this, keep your documents in waterproof boxes containing a few packs of silica gel. You can also add a few in your filing cabinet. When traveling to humid destinations, protect your camera, phone and laptop by storing them in air-tight, waterproof containers with a few packs of silica gel. Humidity can accumulate inside these precious items, so it’s important to take this step to best protect your belongings. A little humidity can ruin dry goods, whether it be spices, dog food or lentils. When you purchase these items, make sure to store them in air-tight containers to prevent mold and bacteria from growing. While you’re at it, throw in some trusty silica gel! You can also use this trick to store gardening seeds over the winter. Just divide each type of seed into envelopes and keep in a Tupperware container with one pack of silica gel. Sweaty clothes and shoes make your gym bag really humid. Event though you remove your clothes at home and wash them, your bag is still full of moisture. 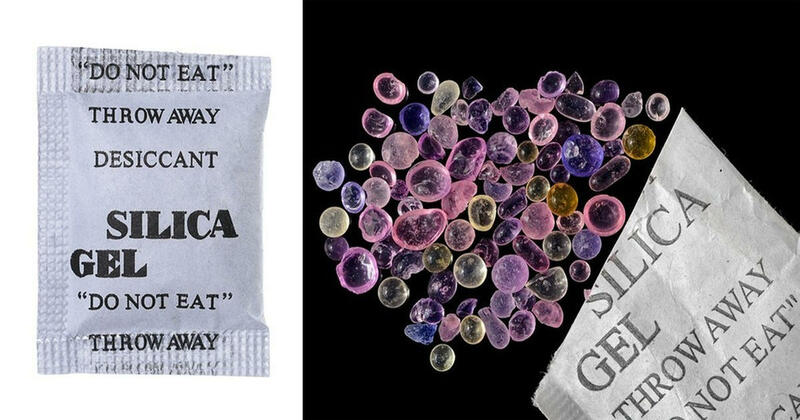 Wash your bag at least once a month and place a few bags of silica gel with your gear to keep it dry. Make sure to shake off your clothes and your bag so that none end up in your washing machine. After using these packs a few times, regenerate them in a 200 degree oven for about two hours and store them in an airtight Ziploc bag until needed.